When the great luthier René Morel passed away on Wednesday, it was immediately mentioned among us in the Emerson Quartet that an era had ended. This is a comment that I am sure finds resonance in the thoughts of others who knew René and were privileged to have been under his care. But just what constituted the era of René? What did he do that was so definitive and unique that he seems to have taken it with him? Those of us lucky to have become professional string players likely remember our first visits to violin shops. Wherever they are, big or small, famous or obscure, they possess a certain magic. There is the usual presence of a multitude of instruments, some exuding age, distinction and fabulous pedigree and value. There’s that wonderful smell of varnish and glue in the air. There’s sometimes the chance that a famous musician will just walk in right next to you. And very importantly, there is the presence of the experts and craftsmen who learned their art in time-honored ways not found in universities or online courses. What they know, you cannot just learn if you want by looking it up in a book or taking a course somewhere. It is often a lifetime of study, apprenticeship, dedication, and for the chosen few, the gaining of an artistry that goes beyond skilled craft and factual knowledge. 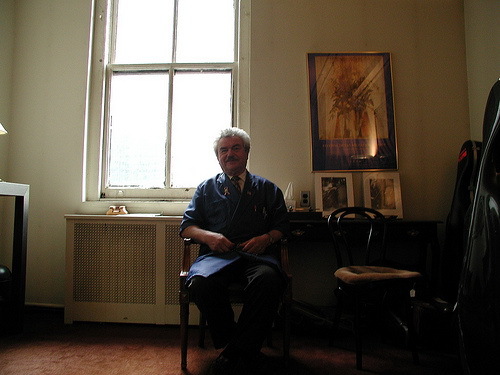 René Morel epitomized all that goes into the makeup of a master luthier. I first encountered him as a star-struck teenager, having been taken to the shop of Rembert Wurlitzer. I can’t even remember what I needed there – maybe it was just a string – but all the magic I spoke of took hold of me in a very powerful way. The personnel in the front – Ken Jacobs I remember well – had a cordial yet intimidating air, but when, for some reason, the people who actually did the work, like René, were summoned out of the workshop, the room stood still in their presences. Along with the magnetic and vital René was the sage-like Dario D’Attili, who was revered for his encyclopedic knowledge and ability to perform miracles of pedigree confirmation. Some years later, as a freshman student at the Manhattan School of Music, I was thrilled beyond measure to find out that René was teaching a course in violin repair, and that I was eligible. I couldn’t believe it, and I actually still don’t understand how he found the time, energy or even the interest to share his consummate skills with a bunch of conservatory students whose skills in instrument repairs barely were enough to change a string. René, however, took the whole thing very seriously, as though he was training the descendants of Stradivari. We had to buy tools: sound post setters, clamps, rulers. We were sent down to the West Village to a paint shop to buy exotic ingredients for varnish. I had an alcohol lamp, and pretty soon I could make my little apartment smell like Wurlitzer’s. Damn! I thought, this is just out-of-sight, to good to be true. I worshipped René, hung on his every word, and got totally caught up in the incredible world he was opening to us. (I was so caught up that I actually managed to leave my cello once in the aisle of the paint shop, not discovering it was missing until I arrived home at 215th street. I have never since driven so fast down the West Side Highway). It was not far in to the course, which took place in the late afternoon, that I learned that after class René took the subway down to the Port Authority to catch a bus to his home town in New Jersey. As I owned a car, I spied an opportunity, and offered to drive him down to 42nd street after a class in my ’54 Chevy. And that quickly became EVERY class, as I was thrilled to have him in my car, paying attention to me alone, hearing his stories and anecdotes and answering my special questions. Wow, was I lucky. Our friendship continued through my evolution as a performer. I had learned through René’s class the importance of a good sound post adjustment, and of a good setup. It was not until then that I even realized what a major component of a string player’s life instrument adjustments could become. 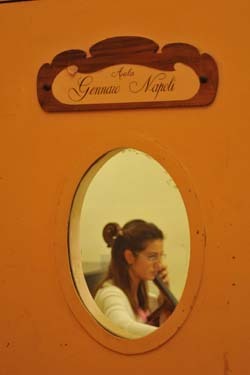 I began taking my cellos to René at Jacques Francais’ shop like any other customer. And, probably unlike with most of his clients, René continued to be my teacher: “What do you hear when you play?” he would ask, never allowing me to simply let him fix it, pay and go. His dedication to me as a student was permanent, and felt truly blessed. And here I have finally arrived at the question I posed at the start of this story: what was it about René that was special, irreplaceable, and of inestimable value? There are many things. First, of course, was his ear. He could hear like an owl. He not only heard the quality of an instrument (which he would remember as clearly as we remember peoples’ faces) but also was able to perceive the amount of effort that it took for us to produce the sound. It was from him that I first clearly understood the importance of the instrument’s mechanics, and that if it was simply out of adjustment, it was not much different than having a bad spark plug or loose steering mechanism in your car. But the miracle of his ear, and his ability to judge, was that his analyses diagnoses could be performed through scientific testing. He just knew, from his vast experience and incredible gift, what to do. The next thing I learned from René was how tricky it is to know how your instrument actually sounds in the concert hall. Most people – instrumentalists and I have to say luthiers – give it their best guess. René knew. He really knew, and he knew it so well that those of us under the most pressure, playing the greatest instruments in the world’s greatest halls, competing with the most powerful orchestras, depended on René to make sure that when the critical performance came, our instruments were at their peak. He proved he could do it, over and over again. No one in his lifetime – even he was totally open to explaining how he did what he did – ever came remotely close. It was not unusual to find musicians in Francais’ shop who had come all the way from Europe or the Far East just to have René move their sound post. That is truly a one-of-a-kind legacy. A “René adjustment” is a phrase that will live on forever. Those of us who had them know exactly what one is. First, it is when your instrument sounds its best, when the sound is full of color, but also that the notes on every string have “core”, a word René used all the time and stressed the importance of. Second, it is when your instrument functions perfectly, when the strings speak immediately and the sound sparkles. Third, the instrument has to resonate, so a balance needs to be found between clarity, focus and “cushion”, another word heard often in his adjusting room. A René adjustment always extracts the maximum potential of an instrument, and also has staying power. It was rare that anyone returned for a follow-up, which usually only happened in the event of severe and unexpected weather change. René knew how to adjust for the future, and for where you were headed, and he was, in my experience, always correct. Another aspect of the René experience that should be pointed out was his understanding of sound production technique. As discreet as René was with his customers, he clearly knew if problems were caused not by the instrument but by the player. René was blessed with the best clientele in the world; he heard and worked with the greatest players of his day, on a daily basis. His point of reference was unmatchable. He probably could have been one heck of a string teacher, but he held his opinions mostly in check, sometimes only barely alluding to the idea that perhaps your instrument was not the culprit. The most valuable lesson I learned from this last point is that ultimately, even with the benefit of René adjustment, it would do you little good unless you yourself adjusted to the instrument, and not the other way around. This is a hard-line, no nonsense approach to playing, devoid of mystique, and with little credence given to personal intrigue or complex relationships between player and instrument. I was always the most comfortable if I thought René was adjusting my cello not for me, but for the greatest cellists he had ever heard. It was my job as a player to measure up, after he gave me the best tools to work with. So the end result of a visit to René was coming away with an instrument that you knew would sound great, but only if you played it at the level at which it was adjusted. It was for me, and I’m sure for others, sometimes a challenge, a reach. But it was an incredible part of my education as a musician and a player, given to me by a single individual, for which I am eternally grateful. It would not be right to omit the immense warmth of René from my list of accolades. 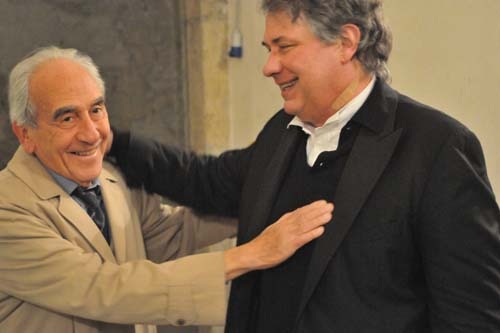 That he treated musicians like me, from day one, with respect and friendliness was always appreciated, and was in stark contrast with others in his profession who took years to acknowledge younger, lesser-known players, as clients of worth. I’m happy that so many had the benefit of his guidance. The whole world of music sounds better for our having had René among us. Not only his work, but our expectations of our instruments and ourselves, live on. Leaving New York well in advance of its record-breaking October snow storm, David, Wu Han, Arnaud Sussmann, Lily Francis and Gilbert Kalish flew to Munich and Salzburg, the closest major airports to the little German town of Bad Reichenhall. Waiting for them was the AlpenKlassik Festival, and CMS’s second European residency of the year. The 2011-12 season is one in which The Chamber Music Society of Lincoln Center is spreading its name and artistry in foreign countries at an unprecedented pace. Having returned from its second residency at the Mecklenburg Festival in late August, CMS journeyed almost immediately to its first tour of Colombia as guests of the Cartagena Festival (see previous blog August-September 2011: CMS Intercontinental). September and October, traditionally busy months, included, for me and Wu Han performances on the CMS opening night, the Mendelssohn Trios at South Mountain Concerts, numerous Emerson Quartet concerts (including an immediate return to the Mecklenburg Festival), we also oversaw the opening of numerous CMS series such as the Late Night Rose concerts and Inside Chamber Music lectures, plus the main stage concerts. Music@Menlo’s Winter Series opened with a spectacular recital by Inon Barnatan (see Wu Han’s previous blog post). 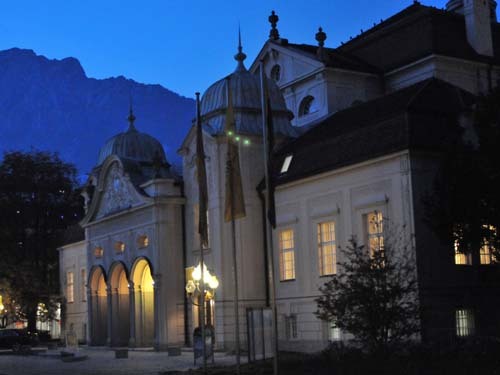 So it was somewhat of a relief to exchange the hectic American scene for the tranquillity of the Bavarian town of Bad Reichenhall, only minutes from Salzburg, nestled beneath spectacular mountains. The crisp fall air and beautiful foliage provided a bracing and inspiring backdrop for four days of intensive rehearsing and performing. Klaus Lauer, our long-time friend as former director of the famous Roemerbad Musiktage in Badenweiler, has more recently become an artistic partner of CMS on three occasions: first, his Night Fantasies series, curated by him for us in New York in the November of 2008; second, this residency for CMS at the AlpenKlassik Festival, which he directs; and third, later this season, as he is featured in CMS’s Winter Festival as a leading commissioner of new music. 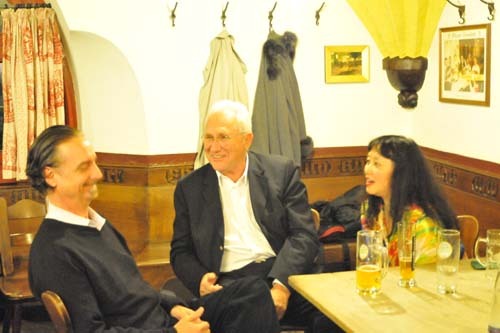 Our programs in Bad Reichenhall were made collaboratively, Klaus requesting from us signature American programming for each of our three concerts. In our opening performance on Friday evening, in the town’s beautiful Königliches Kurhaus, Wu Han, Lily Francis and I began with Beethoven’s Op. 1 No. 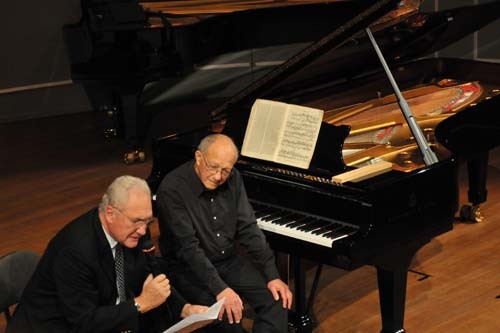 1 piano trio, which was followed by a piece close to Klaus’s heart, George Crumb’s Four Nocturnes (Night Music II) for violin and piano, performed by Lily and Gil using a second piano that had been prepared with all the special markings and equipment necessary to produce Crumb’s magical sounds. The program closed with Beethoven once again, but this time with his final trio, the magnificent “Archduke”, Op. 97, for which Wu Han and I were joined by Arnaud Sussmann. Post concert festivities are always important, and in the hands of Klaus Lauer, musicians are never at a loss for good food and company. 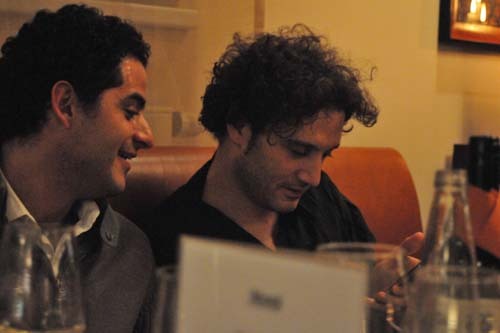 Arnaud and Nicolas amazed the table with outrageous iPhone tricks and games. Saturday’s program featured a major role for Gilbert Kalish, who opened the concert with Charles Ives’s monumental “Concord” sonata for piano alone or almost alone, as Ives included the briefest of offstage roles for flute and violin. Before the hour-long performance, Gil and Klaus took the stage to introduce the work, the performance of which earned Gil a prolonged ovation. German cellist Nicolas Altstaedt (a CMS Two artist who only days before joining us assumed artistic directorship of the prestigious Lockenhaus Festival, hand-picked by founder Gidon Kremer) made his first appearance of the weekend in Elliott Carter’s Figments for solo cello, one of which is subtitled, appropriately for this program, “Remembering Mr. Ives”. The program closed with Dvorak’s ever-popular Piano Quartet in Eb. Sunday’s third and final concert was opened by me with the brief and soothing “Fantasy on a Bach Air” by John Corigliano, after which Wu Han joined me for Beethoven’s sonata op. 69. 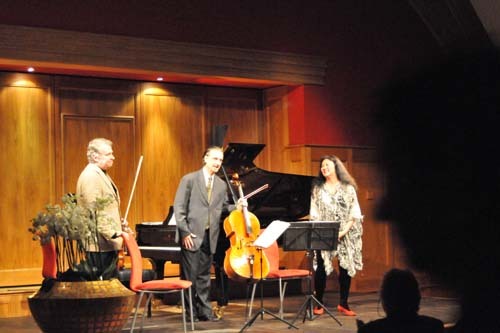 Schumann’s Eb Piano Quartet closed the first half, with Nicolas borrowing my cello (at the very last minute!) in order to execute Schumann’s unusual request for a single low Bb at the end of the slow movement. 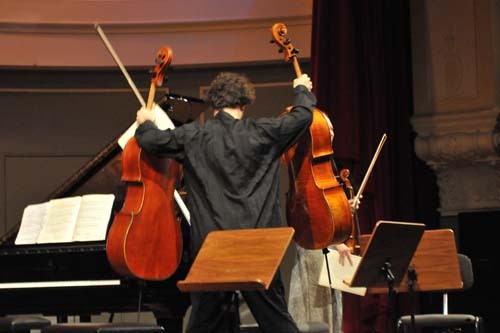 It was fun watching Nicolas negotiate his way on and off stage with both cellos. 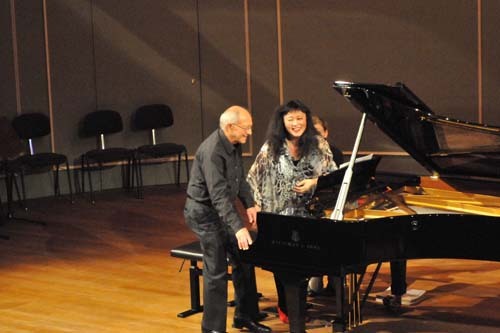 The concert – and this demanding CMS residency – concluded with American music for piano, four hands, Gil and Wu Han offering first Samuel Barber’s charming Souvenirs, and finishing with George Gershwin’s Rhapsody in Blue. 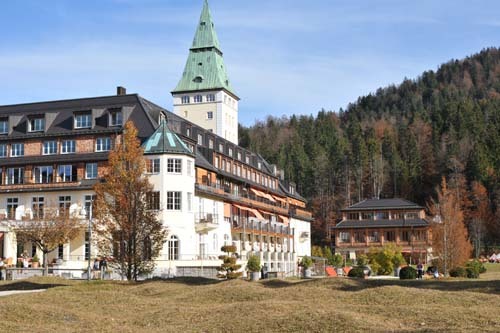 For years and years we had heard about this place: “I just played at Schloss Elmau” – “You MUST play at Schloss Elmau!” – “You mean you’ve never played at Schloss Elmau?”. 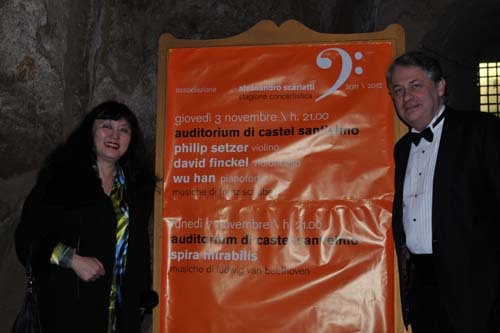 We were beginning to think there was something seriously wrong with our careers, and so, by means of a completely “cold call” , I got our trio with Philip Setzer invited to perform there after our concerts in Bad Reichenhall and before our performance in Naples. 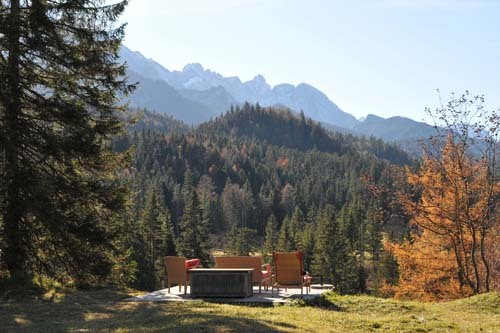 A beautiful two-hour drive from Bad Reichenhall, the famous castle is nestled in the Bavarian mountains near Garmisch-Partenkirchen and the famous violin-producing town of Mittenwald. Emerging from a dense forest, a driver’s first sight of Elmau is truly breathtaking. 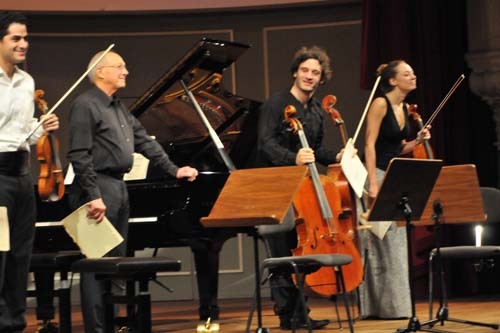 We were warmly welcomed not only by program director Silke Zimmerman but also pianist Pierre-Laurent Aimard, who would play a recital the following evening and attend our concert that night. Such is the life of a musician: just when you think you might have a relaxed performance…. The castle as built in 1916 as a retreat for artists and thinkers, attended. Volunteer “helpers” who came to work there attracted by the contact with notables, attended to the clientele. In 2006 a disastrous fire all but destroyed the place, but under the dynamic direction of family owner Dietmar Mueller-Elmau, the castle was rebuilt to a standard that we have perhaps never encountered in all our travels. Every detail is of the highest quality, the setting is beyond comparison, and the warmth, hospitality and personal attention, from Dietmar himself to Silke and her staff, to hotel general manager Nikolai Bloyd, made us very soon feel like important guests who had been coming for years. 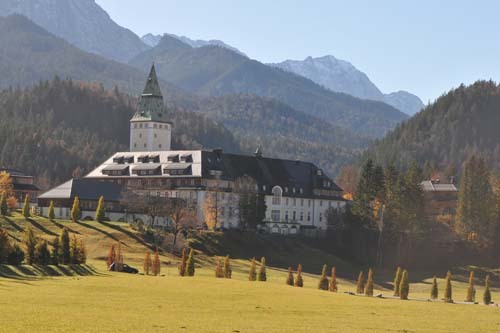 Schloss Elmau presents well over two hundred concerts per year. It seems that literally everyone performs here. In the coming months, for example, both our CMS Two cellists Andres Brantelid and Jakob Koranyi will appear, and so will pianist Martha Argerich. 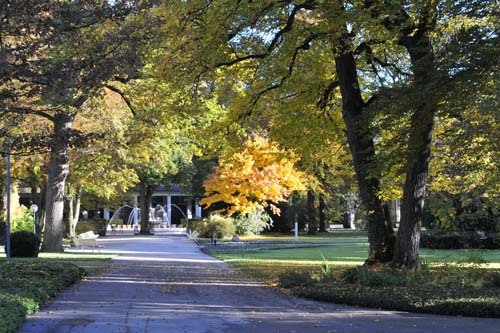 The atmosphere, the beauty and hospitality offer the broadest range of musicians a welcome respite from the hectic concert life, and a place to rest and recharge. Several hundred listeners heard us play Schubert’s massive trio in Eb that evening, including many children staying with their parents at the hotel. It was our trio’s first performance on the European continent. Afterwards we were treated to a sumptuous meal at one of the hotel’s many fine restaurants. 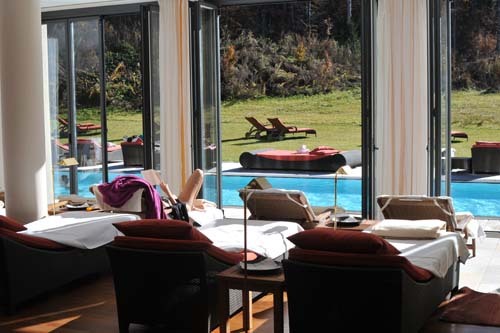 We could look forward to a free day, a chance to use the hotel’s amazing spa, and to walk the endless trails in the surrounding hills. As magical and relaxing as Schloss Elmau was, the irresistible Italian allure beckoned us the following day to our next stop, Naples, for our trio’s second European appearance. 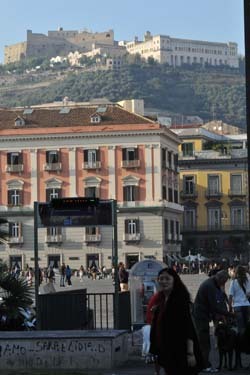 Blessed with a free evening, and perfect weather, the infamous, formidable Neapolitan chaos receded into the background. A 5 a.m. departure from Elmau ensured arriving in Naples by lunchtime, the highest of priorities for us. 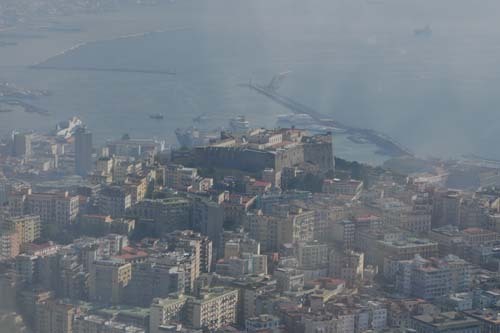 Approaching Naples by airplane, Castello St. Elmo on the hilltop. 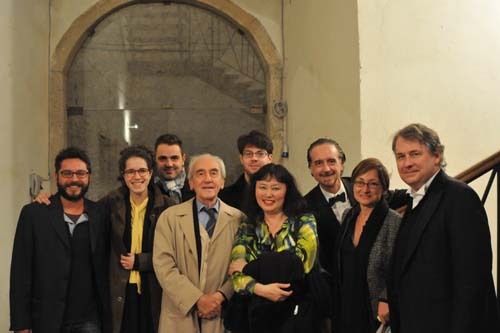 For dinner we were graciously hosted by Professor Lucio Sicca and our presenting organization, the Associazione Alessandro Scarlatti, now celebrating its ninety-first season. We were joined by a small collection of music lovers, including a young cellist who is a student at the local conservatory. It is immediately apparent with these people that their foremost passion is chamber music, as they heatedly posed questions to us such as “Which of the two Schubert trios is your favorite?”. One could not imagine more pleasurable, gracious company (nor better food!). 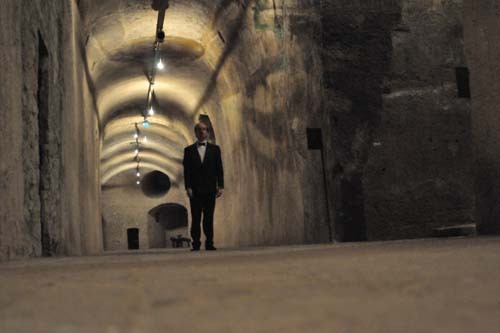 The concerts of the Associazione take place in the Castello St. Elmo, which dominates the Neapolitan skyline behind the city. Across the water, Vesuvius looms large, and still looks threatening. 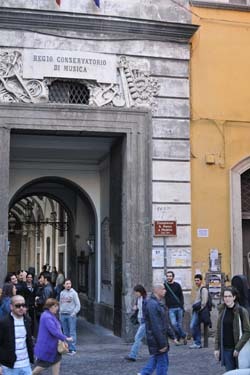 During the morning of our concert day, I was treated to a tour of the Conservatorio San Pietro a Majella di Napoli by my new young cellist friend Chiara. It was the first day of classes, and the place was hopping. 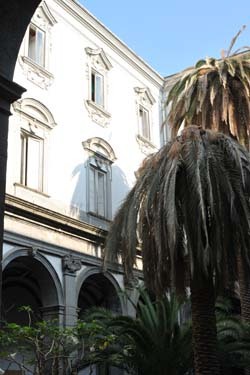 Nestled in a small street in the historic district, the school, which sits inside a magnificent structure surrounding a central courtyard, is situated among music shops, plus restaurants and cafes which afford both students and faculty ample supplies and nourishment. Most astounding to see in the conservatory is its library and museum. 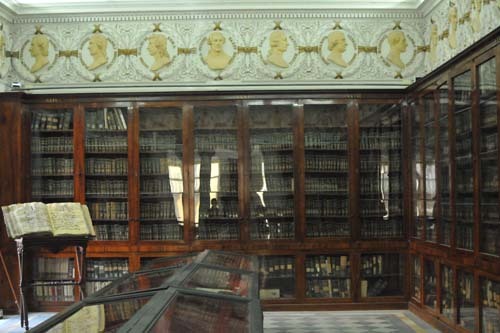 Containing countless first editions and manuscripts of virtually all the Italian composers (plus many others) it affords the lucky visitor a chance to see portraits, artifacts, and music from composers from Palestrina to Scarlatti to Verdi, from performers such as Paganini and Liszt, and instruments made by Stradivari, Cristofori and Goffriller. 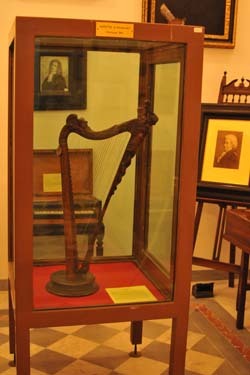 There is even a small harp from Stradivari, and Domenico Scarlatti’s own harpsichord, upon which the lucky students are even allowed to perform. In spite of the challenges of the busy day for the school, I was warmly welcomed by the conservatory director, and shown endless hospitality by a small collection of students, all of whom eventually had their first lessons of the season later that day. But that did not deter many of them from making the pilgrimage up the mountain to hear our two Schubert trios that evening. Driving in Naples is something I have yet to try, and may never will. There is little pattern or logic to the city’s streets, the driving style is New York +, and the traffic jams can be maddening. The route to the castle from the city below is like a maze in which one probably travels ten times the kilometers as the distance actually is, as the crow flies, and the streets become very narrow as one approaches the mountaintop. After the concert, some six hundred people stream into the streets to head home by car, foot or the funicular train, and on this evening, a bus got stuck in a small street where we sat behind it for a good forty-five minutes, killing our dinner plans (as the concert had started at 9:10, we were still without food past midnight). 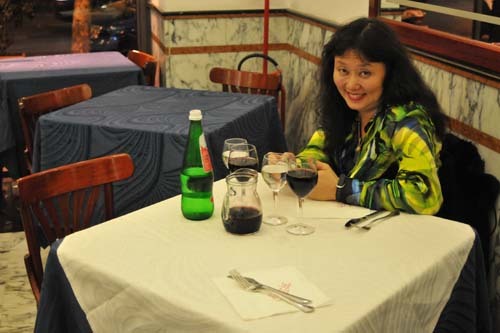 An emergency stop at the last pizzeria open afforded me and Wu Han a last, delicious Italian meal and a good bottle of wine, as we sat not only marveling at the day’s wonderful experiences, but also scanning the hundreds of congratulatory e mails that had come in that day, as the official announcement of our Musical America award had hit the internet that morning. All in all, it was quite a day. 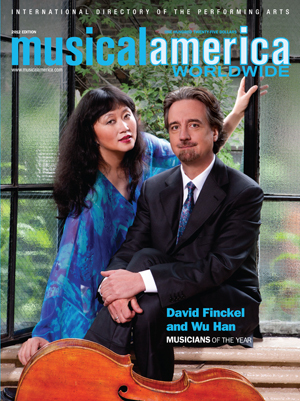 In an unprecedented move, Musical America has selected not one but two Musicians of the Year for 2012: David Finckel and Wu Han. 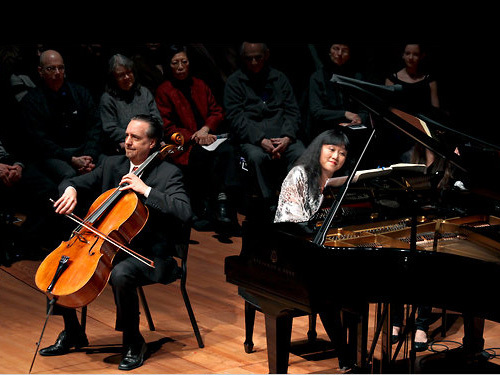 He is a cellist, she a pianist, and together they are the artistic directors of the Chamber Music Society of Lincoln Center, among other organizations. The Musician(s) of the Year Award, honoring excellence and achievement in the arts, are being announced in conjunction with the release of the 2012 International Directory of the Performing Arts. Finckel and Han have managed to breathe new life into an artform all too often overlooked. They have done so not only through imaginative programming and stellar performances, together or alone, but also as founders of Music@Menlo, and as pioneering producers of their own recordings on the ArtistLed label, classical music’s first musician-directed and Internet-based recording company. 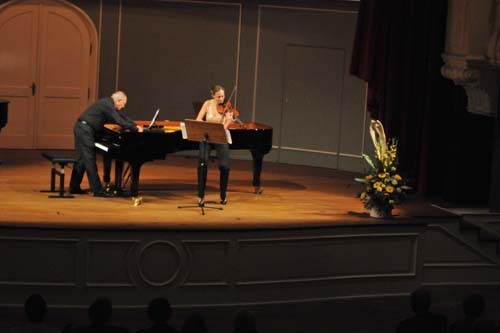 Together, writes Musical America Directory Editor Sedgwick Clark in his citation, they have managed to “create a revolution in the traditionally quiet world of chamber music — in the process building new audiences and rearing a new wave of players. To read the full official announcement, please click here.